"As you lie back in bed, you will put down your novel - or partner - to bathe in the beauty of this music ... you play it one morning and find the pure notes somehow fresh and inspiring." I have heard some beautiful, spontaneous guitar conversations at various times in a lifetime of listening to jazz. The response to these dialogues is a reminder of how entrancing they can be. Wherever this 'here' is, it is a very nice place to be. I am glad to have been there several times and look forward to going again." "There is no obvious generic frame of reference for these reflective and often wistful guitar duets ... these pieces are gorgeous on a moment-by-moment basis ... Their lyricism is consistently attractive." "These mostly contemplative duets burst into surprising and beautiful blooms. Here artistic harmony and attunement results in music that is congenial and serene." 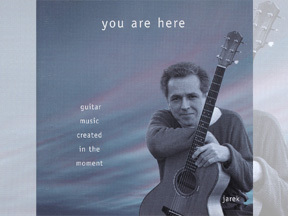 "wonderful ... an uplifting display of artistic harmony - a must for classical guitar fans." The Solidarity uprisings in Poland provided the uncertain and often chaotic setting that inspired the musical collaboration of Jarek Czechowicz and Alan Lem. Together they performed daily, alongside Poland's finest film, theatre and television actors, to full houses in Warsaw's Powszechny Theatre. Their audiences comprised people who sought peaceful change in Poland's troubled political landscape. While with the Powszechny Theatre they won first prize in the Poland's National Theatre Competitions. Their music has evolved from a blend of classical and contemporary styles leading to pure improvisation played like a flowing conversation.